*Note: As this unit could have parts loosing caused during transportation, so please DO check item carefully before testing. If the inverter is damaged by the courier seriously please report this to the courier right away. *If customer needs to use refrigerator, can switch the mode to power save on, as refrigerator only will work every half an hour or one hour , but inverter stay in power save function, no load current is 0 amp, will save power. 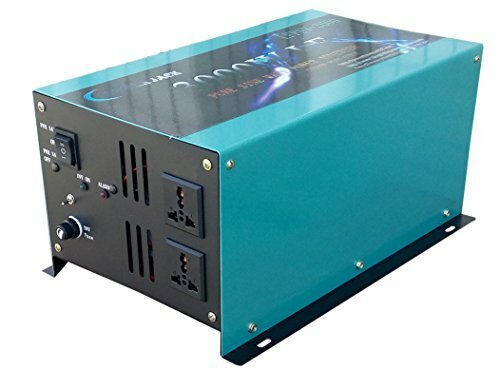 Low frequency pure sine wave power inverter is available for sensitive load, accept generator’s energy output, high power factor, can run appliances with motors, engines, special light and TV. Feature: Ideally suitable for Journeys, Camping, Tents, Boat Trip, Working on the way and everywhere, where is no electricity ! Simply connect our with a 12v bty. For example as in a Car, Motorcycle, Camper or Boat and use 110v electrical appliances. Related Posts "12000W peak 3000W LF Pure Sine Wave Power Inverter DC 12V to AC 110V 60Hz – Go4CarZ Store"